Houston's original PIANO SCHOOL for children ages 7 and up. Magic in music, magic in arts. In Houston Heights. Mission statement: APT engages children in the magic and freedom of performance crafted through the creative process in fine arts. With Dr. Loreta Kovacic, musical “alchemist”, Grammy nominated artist and Carnegie Hall soloist. She holds a Doctorate Degree in Piano from Rice University. 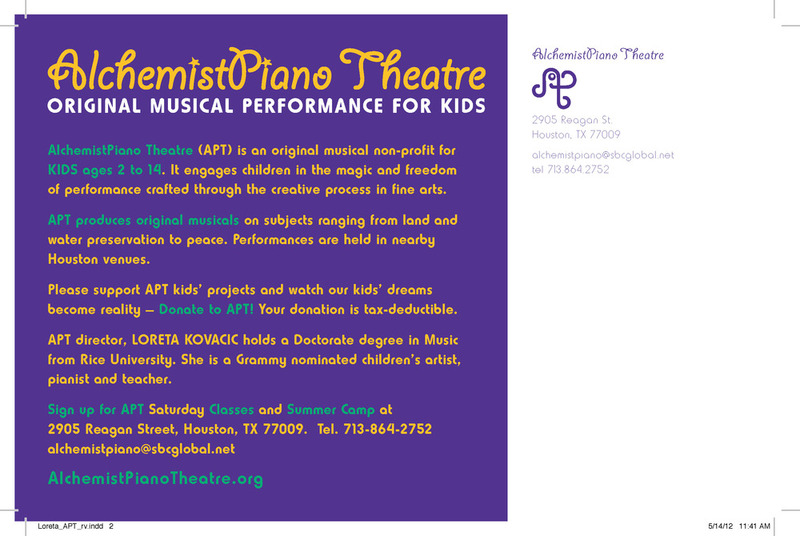 APT is a children's theater group founded by the inspiring, Dr. Loreta Kovacic, pianist, teacher, composer, and singer. The purpose of APT is to inspire children through creative performance and to help children build confidence in their daily lives. What sets APT apart from many other theater groups in the area is that we welcome and encourage all children, so that they can learn to express their creativity and enjoy the pleasure of collaboration through the production of original shows, unique piano-vocal concerts and performance art events. APT produces shows with a maximum of 20 performers. APT's artistry comes from our concept of cooperation, small and intimate production, strong improvisatory element and individual attention. Magic in music, magic in arts! APT currently offers only individual PIANO LESSONS. They are a comprehensive musical exploration of piano technique and all piano repertoire from classical to jazz. Our piano students also explore individual creative interests in music from singing, songwriting to music theory and composition. At the end of each semester, students put on public shows at many venues in Houston, from "Lights in the Heights" festival to Discovery Green stage. One of our past original theatrical productions, "HELP SAVE THE OCEAN play" is a story about the amphibian jelly fish who made one ocean bay in "Bavaria" black with their ink. This play is written for Middle School and for a large cast. It includes 3 original APT songs. Other APT musicals deal with subjects like space exploration: 'SPACE WIGGS", promoting peaceful solution: "TADPOLES FOR PEACE", traveling and expanding horizons: "ALICE IN PARIS" and Christmas: "ISLA MUJERES HOLIDAY". Other performance locations include: LIGHTS IN THE HEIGHTS, DISCOVERY GREEN park in Houston, CAMH, MARDI GRAS MUSEUM in New Orleans, various Schools, Art Non-Profits and Churches in Houston. piano lessons, APT children's shows, customized concerts at various Houston events, family public events such as "Houston Live" radio show, etc. In the Heights since 2000. Few time slots still available. 701 Byrne, Houston, TX 77009. Alchemist Piano Theatre develops musicianship, confidence and creativity in musicians ages 7 and up. As a teacher, Dr. Kovacic is eclectic in her choice of music and focused on inspiring students to be creative thinkers, not just piano players and singers. Listen to KUHF radio "Front Row" archive where Loreta Kovacic talks about APT with Bob Stevenson.